Celebrities can't get enough of Nicolas Ghesquière. 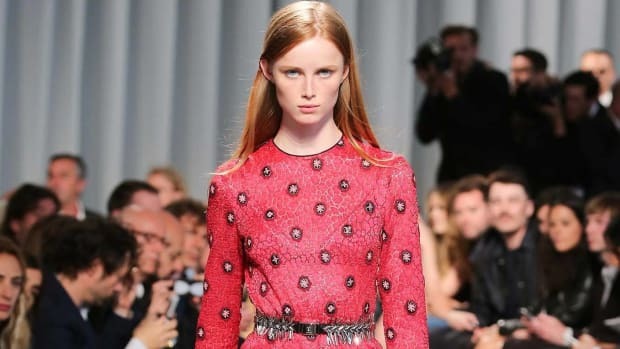 The Hollywood crowd certainly loved Nicolas Ghesquière&apos;s creations while he was the creative director at Balenciaga, and unsurprisingly, they&apos;ve stayed loyal since he made the move to Louis Vuitton earlier this year. Zoe Saldana, who is busy promoting her new action flick, Marvel’s "Guardians Of The Galaxy," showed her support on Monday night in this two-piece look from Vuitton&apos;s resort 2015 show. The actress (who according to Internet gossip may or may not be pregnant) wore a sheer embroidered top paired with a white bralet, a slinky belt and a tight, sequined skirt to the movie&apos;s premiere in Los Angeles. Despite the sexiness of the see-through top, Saldana looks equal parts edgy and elegant, thanks to her strappy Jimmy Choo sandals and delicate rings. While the look was shown with a more minimal and slightly messy beauty look on the runway, Saldana went in a more glamorous, premiere-appropriate direction from the neck up. Saldana is the latest in a slew of stars — Gisele Bündchen, Nicola Peltz and Adèle Exarchopoulos to name just a few — who have already stepped out in pieces from Louis Vuitton&apos;s resort collection, but given how cool it continues to look on the red carpet, we&apos;re betting she won&apos;t be the last. Nicolas Ghesquière is bringing his show on the road to California. Nicolas Ghesquière is riding the streetwear wave for Spring 2018 — but with an 18th-century twist. Nicolas Ghesquière, behold your power at work.